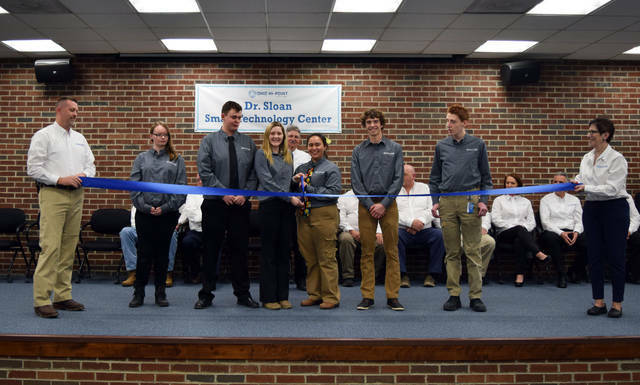 BELLEFONTAINE – The Ohio Hi-Point Career Center unveiled the new Dr. Sloan Smart Technology Center to community members, business, industry, and educational partners as well as local and state politicians Wednesday evening. Dr. Sloan Smart Technology Center was created to address the growing industry needs in the district’s local communities. Within the new space, students will work with industry standard equipment to develop the skills and earn industry credentials through a partnership with the Transportation Research Center and The Ohio State University. The program will also provide students the opportunity to gain college credit to area institutions like Clark State Community College. Several community partners were involved in making the Dr. Sloan Smart Technology Center possible including the Dr. Sloan Foundation and Trustees; the project construction team consisting of Freytag & Associates, Thomas and Marker, Honeywell, Vaughn Electric, and Regal Plumbing; as well as equipment, curriculum, and design partnerships with Honda Transmission Manufacturing, Clark State Community College, the PAST Foundation, Transportation Research Center, Rittal North America, and the Ohio Hi-Point Board of Education and staff. Ohio Hi-Point will welcome the first group of students in the Applied Manufacturing and Smart Technology Engineering programs next fall. High school sophomores can still apply to Ohio Hi-Point by visiting www.ohiohipoint.com/admissions. “The Dr. Sloan Smart Technology center is the start of our vision for what we want to accomplishment with our proposed permanent improvement levy, which will be on the May 8 ballot,” said Superintendent Smith. “Our goal is to provide these types of learning environments for our career programs and academic classrooms on the Bellefontaine Main Campus as well as upgrade the equipment, technology, and tools within our district satellite programs.” finished Superintendent Smith. For more information about Ohio Hi-Point’s permanent improvement levy and to read the district’s FAQ page, please visit www.ohiohipoint.com/PI.